Reviewing what you've learned - through the whole book! Hair has a shape like any shadow shape or positive form. It has shadows and highlight within itself. 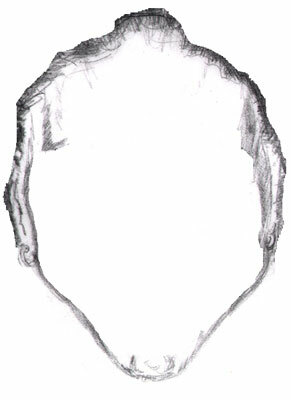 There are sub-shapes within the overall shape of the hair. Hair likes to stick together in clumps or curls. 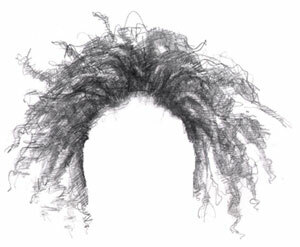 These clumps and curls and locks all become the "sub-shapes", i.e. the smaller shapes within the overall shape . As far as highlight and shadows are concerned those sub-shapes generally follow the same shadow and highlight pattern shapes you find in primitive forms - since they're generally in some sort of primitive form themselves. the first is with Ani without hair. Next the sub-shapes are drawn in - she almost looks blonde. There's a close-up next showing the fairly uniform - but loose - hatching. A loose feel matches the look of this hairstyle. Further layers of hatching are then added. The areas that are darkest receive the most layers of cross-hatching. As far as general patterns of hair shadows and highlighting are concerned, hair tends to be darkest right where it intersects with the face, and then again at it's outermost edge. You also need to weigh hair color. Blondes get by with much less hatching. 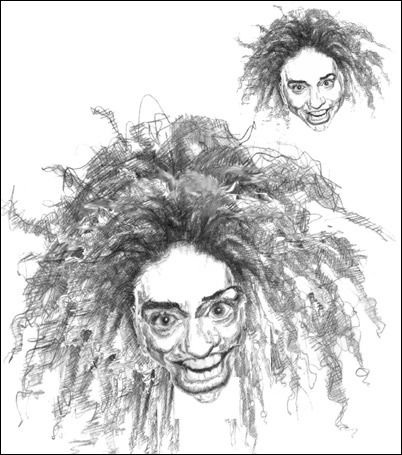 Afro-hair is made up of lots of tiny curls so using what kind of lines do you think would work for this kind of hair? Three guesses. Yes, tons of teeny tiny curls is both realistic and effective - with or without hatching too. We kind of worked in reverse to arrive at the overall mass of hair shape in this particular picture: the sub-shapes were drawn first. They're pretty random, and they go all over the place. In the aggregate, they do form a shape. You can't really appreciate that overall shape until you draw all the subshapes - which is why when drawing you need to have an overall outline in mind that will contain all the subshapes. Does that make sense? Let me illustrate in a slightly differently way. Think of a tie - a man's tie, you know, kind of a long triangular shape with a a point at the bottom? Can you see that in your mind's eye? Now, picture that tie as being completely black. Just a long, stretched out black triangle, right? Close your eyes. Envision it again. Open your eyes, imagine the same shape again. Good. Now, picture the most flamboyant, colorful tie with all sorts of overlapping rectangles, squares, circles and cylinders. Now picture that sober black tie again. Next step: in your mind imagine all those funky geometric shapes fighting for space on that same, triangular black tie shape. Imagine yourself drawing the tie by just drawing the geometric shapes within it first - so that when you've drawn all the geometric shapes you've in essence drawn the tie shape by default. Your awareness was on the geometric shapes. The overall tie-shape reappeared as a direct result of that attention on the smaller shapes. Does the way the overall black tie shape remind you of anything else? It might remind you of the section on "formats" (Lesson 6: Negative Space ). A format as by by now I'm sure you're aware is the overall shape or frame you put any picture, painting or drawing inside of. You may not even be aware of it, but you're using a format when you draw on paper - the paper is the format, the containing frame. So when you draw hair, or the overall hair shape, often times it works well to envision the overall hair shape - without drawing it on the paper first - but then you fill in that imagined shape with actual lines on your paper. I hope that makes sense. What fits and stretches into this space? In the areas to the sides of the nose, namely the cheekbones, (the cheek bones and the area around them) might get stretched and elongated along with the nose. They could fill this space between the middle of the eyes and the middle of the mouth. What's that saying in terms of exaggeration? I kind of already said it: you could give Ani longer, bigger cheekbones too - cheekbones that might stretch as long as the nose in this middle space between the middle of the eye line and the bottom of the nose line. You also saw that mouth, lips, and chin all seemed to be proportionate with those of Mr. Average - but only because her mouth was open a little bit. Then I dragged you through a long explanation of why it was important to accurately identify the real middle of the mouth line which is demarcated by the lower margin of the upper teeth. If we corrected for that, that is if we mentally closed her mouth we saw that her features - upper and lower lips, teeth, and chin - got crammed in pretty snug. Her chin is smaller and pointier proportionately than Mr. Average's. The lower lip dips down pretty low too, and it became that much more obvious when you start applying the horizontal landmarks (but more on the actual features in the "feature by feature" section). Side note: Here's a kind of useful measure we haven't talked about before: it's the dimensions of proportion around the mouth and chin. You can fit an eye width around the mouth out to the edge of the chin On Mr. Average you can draw an eye width of radius around the lips. 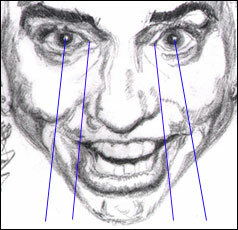 That is, extending an eye width radius to each of three landmarks of the mouth (the two corners and the the lowest margin) and you have a measure for sizing up chins to. Applying that will really round out the proportion here. With this picture in mind you can see - with empiric proof - that you now have permission to shrink Ani's chin even more, or to somehow make the elements around it dominate it. In Part II, we named some subtle dimensions and named *non-traditional features that faces in general share. (*Non-traditional in the sense that most traditional drawing books won't label all this detail; it's my firm belief that unless you know about certain details - that they exist at all - you won't look for them ). And you saw a whole list of things. For instance we saw there's some asymmetry in everyone's face - Ani's included. We saw the little differences in the heights of the lines at the corners of the mouth, the eyebrows, the way the lower lip curves more to one side than the other. We also saw in Part II how we've really been building our visual vocabulary: We named things. 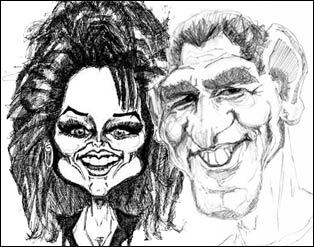 We considered the point of view that the real key to drawing great caricatures as well as great portraits was knowing what to look for and that by having a name for it, you can actually look for what you've got a name for in the first place. "You'll see it when you believe it" rather than the reverse. And then there's the overall caricature rule that dictates that when caricaturing women, you cut slack - not because women can't take it or anything like that, but rather because there's such a double standard in the world placed on women's looks. (I'm not going to get into the whole argument here, mostly because I only have superficial understanding of it, but take my word for it - and I'm sure you have some feel for what I'm talking about especially if you're female - there's an injustice to women here.) To give women a break when caricaturing is firstly just good manners and secondly, some kind of small repay for the unjustness. spaces between features, feature sizes neck size, etc. The horizontal and vertical landmarks/guides gave us a framework to work with. They allow us to do a general sizing up of the face, connoitering the face the way a sheep dog tightens up the herd: from the outside working his way in. Part IV we really got into the nitty gritty of taking apart all the different shadows, common shadow areas and specifically, the features. Did we really discover anything new going through all that? Maybe, maybe not but you got one more layer of depth excursion into what little things make a feature noticeable. 8) the shadow under the chin that roll on to the neck"
What a deal. So, so far, how would you exaggerate Ani? Let's look at Ani feature by feature very rapidly - yes, this'll be more repetition, but as you review ask yourself if maybe you can't start forming in your head a direction the exaggeration might take. 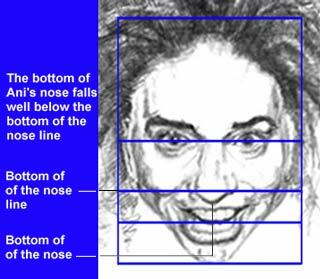 Remember, you can get lot's of practice learning to zero in on the outline of the face and head by reviewing and doing the exercise found in Flash Interactive Three. Click on the picture if you have the e-book on your computer otherwise click here for a link to the Flash exercises. 3) The nose we said was slightly bulbous, but in Part IV we saw a lot more than that. We saw how it was proportioned, where, i.e. which part of the nose's three wedges was most disparate when compared to Mr. Average. We saw how it blended into the nasal root (at the forehead) and with the eye brows and the eyes themselves. We saw how the tip of the nose had the most mass, how the central wedge was proportionately smaller than that of Mr. Average, the wedge where it emerged from the forehead was broader than the Average model. Yes, we got ridiculous. But these are all the little comparisons you'll learn to make unconsciously as you gain experience. 4) Then we looked at the mouth: which is really a combination of the apron of the upper lip, the lips themselves, the teeth, and the shadows that are all a direct result of the bony under-structure underlying the tissue of the lips and mouth. Then we looked at the mass of the lips themselves. When dealing with the mouth we're dealing with curves and and rectangles (like teeth), and spheres and cylinders and constantly changing highlights, and shifty shadow shapes and the ever unsteady dynamism of lips that change with every spoken word and emotion. Still, we discovered we could find some characteristic constant - at least one you might find within an expression frozen on a photograph or through familiarity with any given subject (in this case Ani). Characteristic enough to draw anyway. And we saw how intricate and involved shadows could get (and of course, to collapse all that complexity into something manageable, you saw how squinting was a very valuable tool). and did I say BEEEG hair? Of course, when I say "big" or "small" or "narrow" or "long" or add any of those modifiers it's always implied that that feature is big, or long, or, wide, or narrow, or redder, or bluer, or hairier or whatever in comparison to Mr. Average or to your own intuitive, built in measuring scale. I know, not very flattering. I know there's a much more complimentary way to draw her, but there's a little twist: I did it all on computer! All I did was resize existing features according to what the vertical and horizontal landmarks suggested and by what jumped out at me intuitively. Does the caricature work? Again, kind of but a bit cruelly. I felt pretty evil after finishing this one (I'd be a liar if I said I didn't laugh though :-). It's not the "quintessential" caricature of Ani, but it's a start. Yes with a little more time and effort and re-working of this ground floor attempt, I have confidence I could come up with a winner. Let's look at everything you've done to get here! OK! You've done stupendously. You've muscled your way through a mighty amount of material. Let's look real quick at all you've done - and you can go back and review if you need to brush up on any of it (there's links to all the main sections). It's your turn to really caricature. Yes, you can do it! 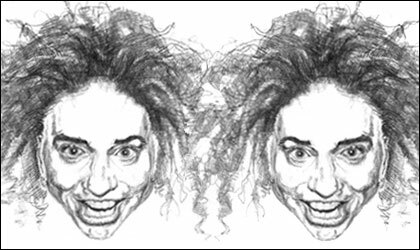 Now, instead of me doing all the caricaturing, it's your turn. Yep I'm putting you in the hot seat. And not to worry, I've done most of the work for you. But this is your stepping off point, your first nudge out of the nest. And you are up to the task. 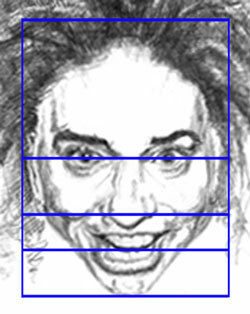 Remember to "get out of the box" - the features do not have to fit on the outline of the face! One eye can be huge, the other small. The nose can be pasted together from two noses. Piece it together any way you like, two, three, a dozen times! Just have fun with it. Then, when you're done, send me a photo copy of the finished hilarious concoction and it will be my total pleasure to post it here in the book - forever, for the whole world to see! Print out all the features. Print out multiple copies of each. Take a scissors - cut out all the features. You might want to get an envelope or a folder for each set of them (an envelope for eyes, one for lips...etc. 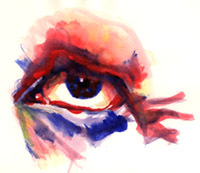 eyes). 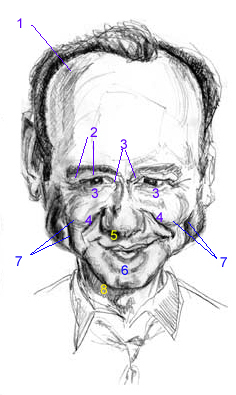 Here's the fun part: after you cut out each feature, lay out 3, 4, even a half dozen of the overall outlines of the face. Then just stick them on wherever you think they look "right" - but try this from as a wild a perspective as you can. See how outrageous you can get and still maintain a likeness to the original Ani. In each outline, start experimenting with spacing, with different sized features, (proportion) try mismatching a big left eye with a small right eye, a big right dimple with a small left dimple. Stick in a long nose, try making it crooked. Just experiment and experiment and see what wild combinations you can come you with. Have a beer or a glass of wine so you're feeling just a hair less inhibited and just a trickle more evil! Now go for it, dive in. Send me a picture of your wildest conglomeration and I'll post it for all to see! Other exercises. Go to a magazine and cut out bodies - all different sizes, genders, types of clothes - you'll be adding these to your finished faces. Draw, draw, draw! Collect and build a library of drawings and caricatures you like and admire. Then draw them. Caricature the caricatures. If you can put aside 20 minutes a day to just caricature a caricature, you'll make amazing progress. Use a timer and quit when times up. Flash Exercises. Return to the Lesson 15 Master Link Page, go to the Flash Interactive Exercises and start rehearsing the information there. There you'll drill home concepts like the the vertical and horizontal landmarks and guides as well as step into some real caricaturing opportunities in parts three and four. And just below that, on the Lesson 15 Master Link Page are links to Archive pages that go through shorter feature-by-feature explanations of selected celebrities. So head on back there and step up to the plate. You can do it!